Want Members to Vote in Your Credit Union Election? But your members can’t and won’t vote if they don’t know there’s an upcoming election and they don’t understand why their participation matters. To help credit unions achieve the highest voter response rates possible and get the maximum return on election investment, we created the eBook 10 Proven Ways to Promote Your Credit Union Election. We know these tactics work because we’ve worked with hundreds of credit unions to successfully implement them. 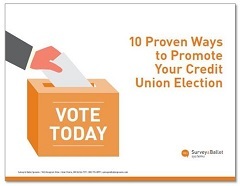 Get your FREE copy of the eBook 10 Proven Ways to Promote Your Credit Union Election now. And if you have questions about your credit union’s election, feel free to contact us at any time. We’re here to help.